Tail: Pin - definitely at original construction, currently a repaired small square tail. internal fin rovings - the fin has been set deep into the blank with a mitred recess on each side. The rovings have been laminated into the blank and covered with laminated cloth. This is difficult to observe (and photograph) because the work is covered by black gel resin. - blue/white shadowed rectangle below main decal. See Notes and image below. Source : Albion Park Rail, NSW - no available history??? Purchased by ?? ?, August 2004. Deck heavily waxed, .bottom dirty, repaired dings to nose, tail and bottom. Althougn credited with the introduction of the shortboard with the Vee bottom Stubby design of 1967, Bob McTavish shaped an 8ft 4'' pintail design with Ted Spencer at Keyo Surfboards during 1967 - "Little Red". Ted Spencer won the Windansea Contest, Palm Beach in 1967 on the board (see The Fantastic Plastic Machine) and then took it to Hawaii for the 1967-8 winter (see The Hot Generation). Bob McTavish and Litle Red, Honolua Bay, Maui, 1967-8. Volume 1 Number 12, circa 1969. This was quickly abandoned, and as the year progressed plan shapes literally reversed to a fully foiled gun derived template. Wide points moved dramatically forward (up to +ve 12'') and tails narrowed, with three main variations. Many boards were stringerless, but the newly introduced coloured resin glue-line stringer was also widely used. Volan fibreglass was an industry standard and the boards usually have identifiable laminated rail overlaps, often with deck and/or fin patches. 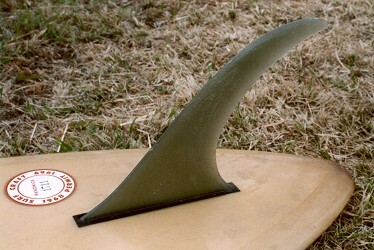 Fins usually were large Greenough-influenced flex fins, with advanced placement towards the nose. The first commercially available finboxes were introduced in 1968 - WAVESET (by Morey-Pope) and SAFESET (by Fins Unlimited) - from the USA. These were fitted with a selection of molded plastic fins. Image courtesy of Gordon Wood's Archives. A circular vinyl sticker usually white and one colour, to indicate the year. Printed text includes the council area and year validated by an individually stamped serial number. These were issued by Sydney beach side councils 1962 – 1968 as a reaction to public concerns about safety. Valid only for the beaches of the issuing council and policed by beach inspectors and surf club members (sometimes resulting in confiscation) the system was reviled by boardriders. Perversely the stickers are now highly prized by surfboard collectors. A similar system was in use in the US at this time. A classic design .of the period , with some experimentation in the unusual setting of the fin. 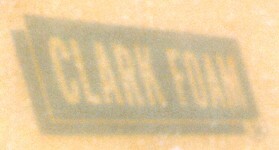 The Clark Foam decal is of interest - the original US foam manufacturer, I am unaware of the brand being manufactured in Australia. 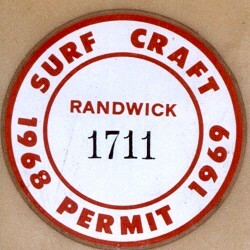 The surf craft permit significantly suggests manufacturing date. 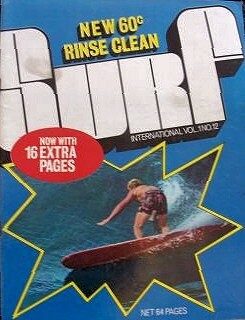 Surfing World Volume 12 No. 1 1969. See above.